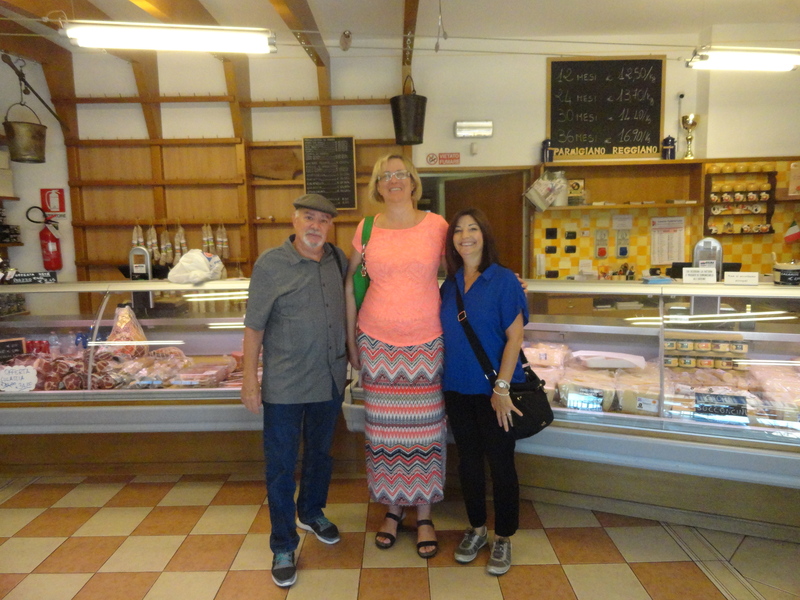 We were fortunate enough to find a wonderful private tour which included a visit to two traditional producers of Parmigiano Reggiano, and Parma Ham. Our tour guide, Giulia Marinelli was just wonderful. We traveled in her car and talked about everything from the Italian economy, the presidential race in the US, and our families. It truly was a wonderful half-day tour and one that we would recommend to anyone visiting Parma!! We started the day at the Consorzio Produttori Latte located in Baganzolino, Parma. This factory is a traditional cheese producer. First of all, did you know that Parmigiano Reggiano is simply made from local cows’ milk, heat, and the brilliance of the cheese mater’s experienced hands? 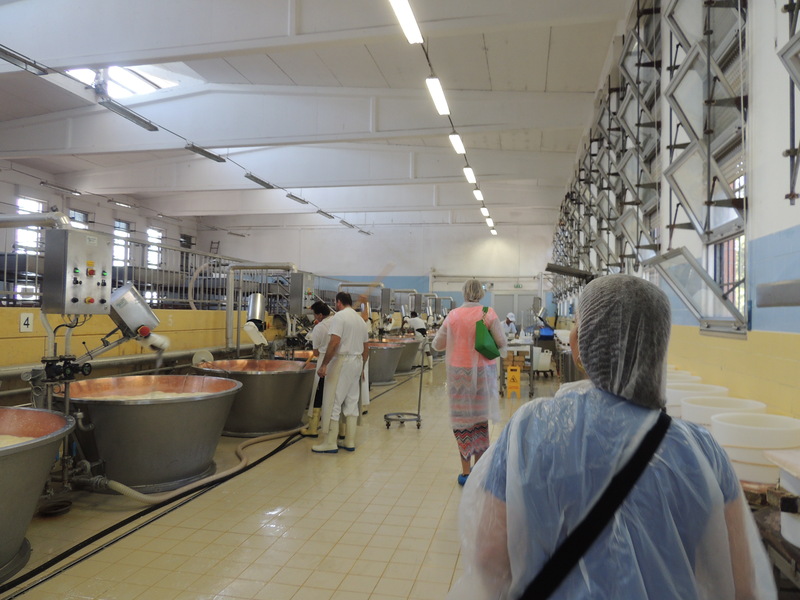 This factory is a consortium of dairy farmers who bring the cows’ milk to the factory to be processed. They start early in the morning and each step is carefully timed and supervised. There are a total of 13 vats which produces 26 wheels in one morning. 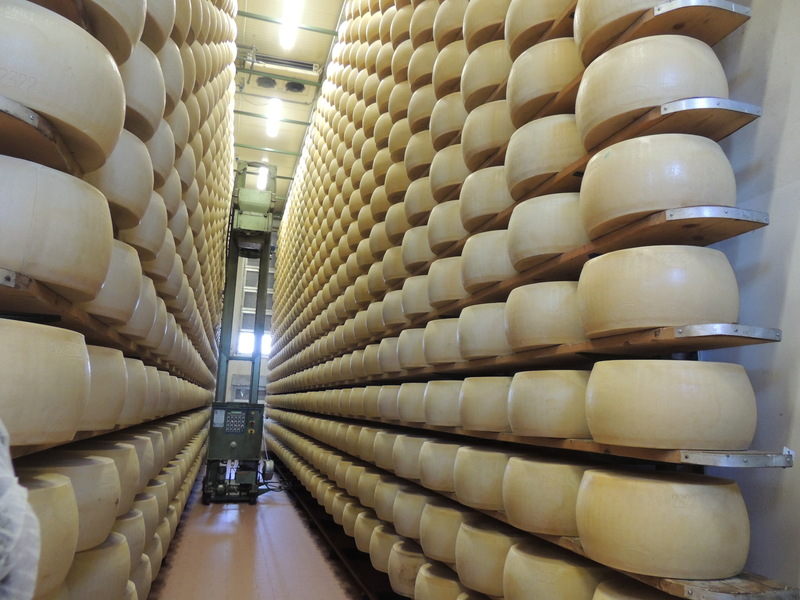 Each wheel of cheese is “born” and takes 2-3 years to properly age before being sold. The cheese master and his crew work 7-days a week and most noteworthy, if the cheese master wants to take a day off, he has to find another master to take his place! The cheese below is resting and waiting for its salted bath. 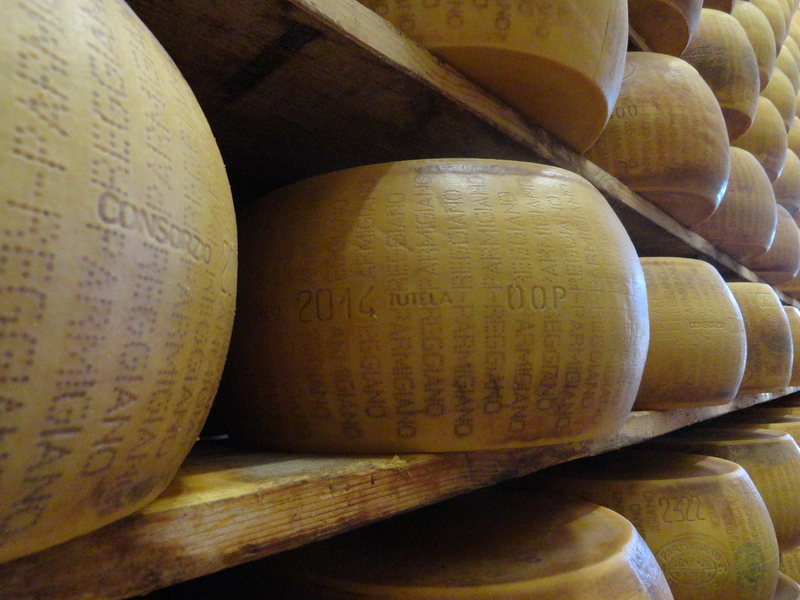 It gets the rubber label put on the inside of the ring to indicate that it is authentic Parmigiano Reggiano. Each wheel also gets classified into three classes. The first class gets the highest rating, the second class gets red lines across the exterior; and the third class doesn’t get the official seal and the outside of the wheel must be shaved off. This third class is sold or becomes grated. Giulia explained that each wheel is inspected numerous times throughout the process by a controlled government agency. There is a “housewife” which is a robot that takes each wheel off the shelf, cleans the shelf and the wheel of cheese with brushes and rotates it before placing it back on the clean spot. Very cool! They have a store where you can purchase some salami’s and local items and of course… Parmigiano Reggiano from the factory,!! Oh we so did!! Gary, Giulia Marinelli (our wonderful guide) and me. Guilia was very tall! We learned so much from Giulia that we now know how to choose an excellent piece of Parmigiano Reggiano by its texture and color. We had always not chosen the pieces with the white specs and now we know that is what you need to look for! We stopped at a traditional producer in a hillside town in the southern part of the Parma providence. 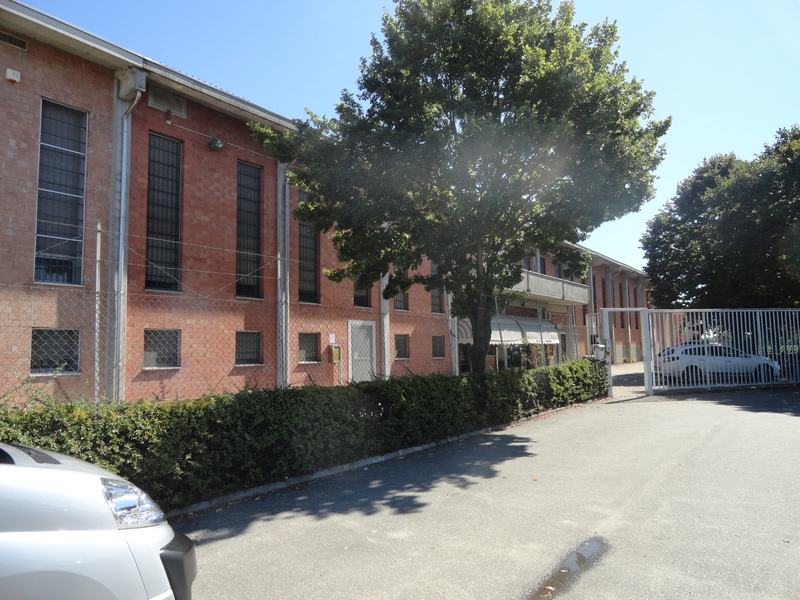 Salumificio Conti is located in Valle di Castrignano. This factory is family owned by the Conti’s and has only 11 employees producing 60,000 hams per year. 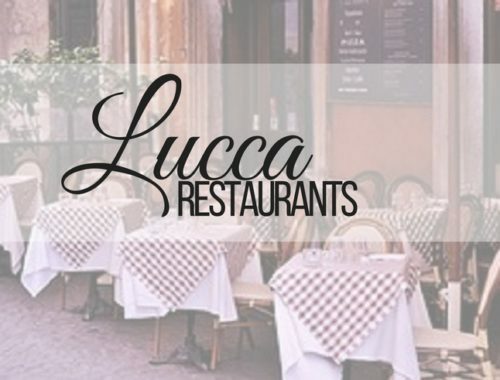 Here we learned that top quality local fresh pork, coarse sea salt and the sweet briny air of the nearby Ligurian Sea are the only ingredients necessary to make Parma Ham. 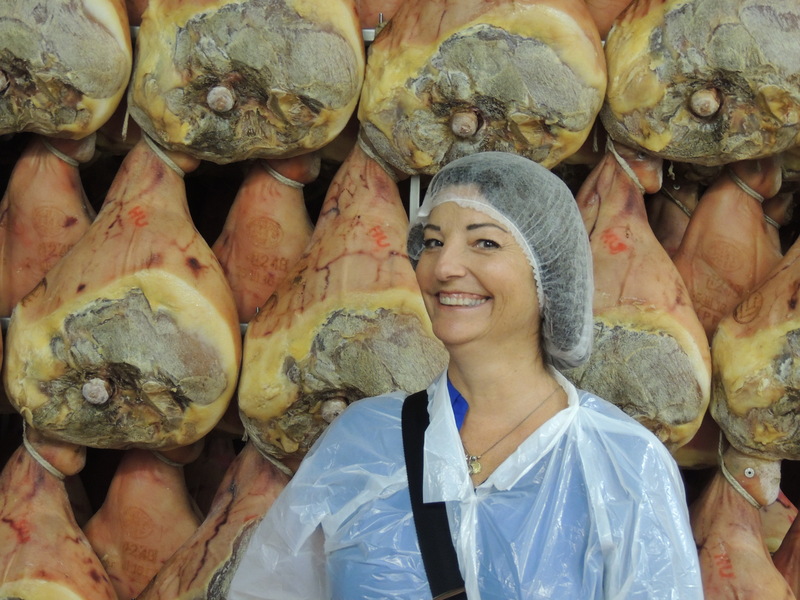 Giulia took us through the factory and showed us the process of how true Prosciutto di Parma is made. 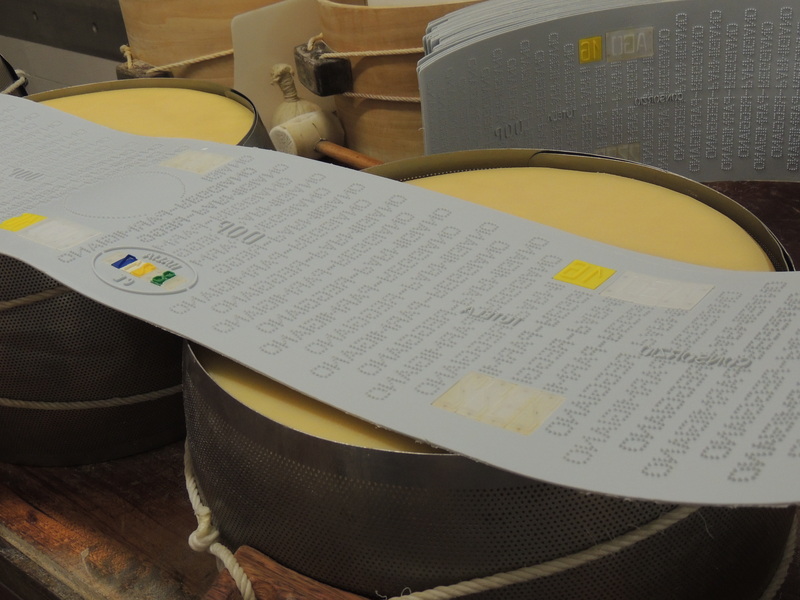 Again like the cheese, it is a lengthy curing process of 12 months to 3 years. 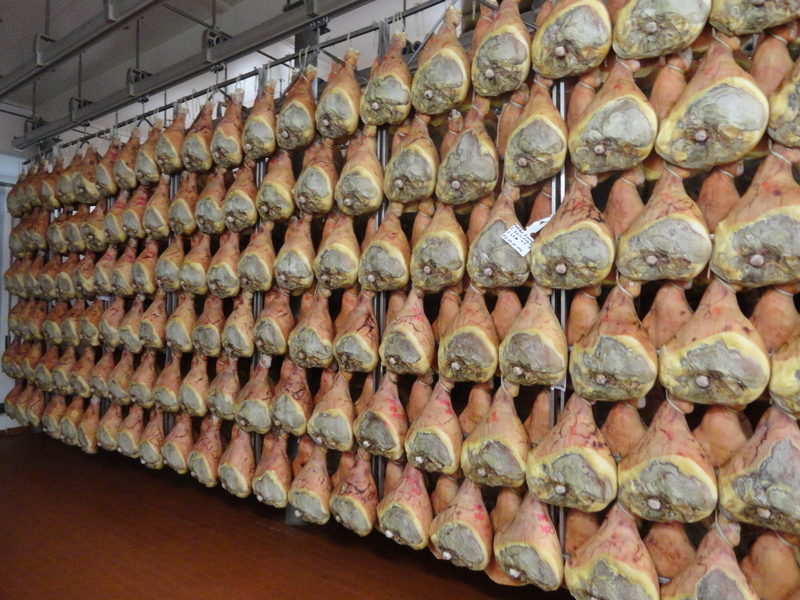 You can tell a prosciutto factory by the building’s windows. 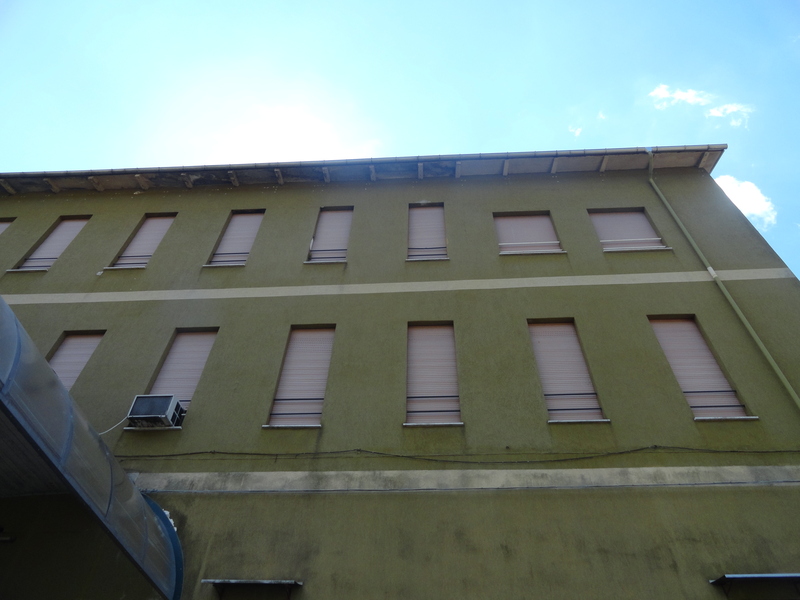 These long and narrow windows indicate that Parma Ham is being made inside. Depending on the weather and time year, these windows are opened to allow the natural air flow to cure the ham. These buildings are strategically built and facing a certain way in this valley to allow this. The pigs must be raised in Italy and are fed the whey from the Parmigiano Reggiano factories and a certain type of grass. They are treated very well and grow to be quite fat; approximately 300 lbs. 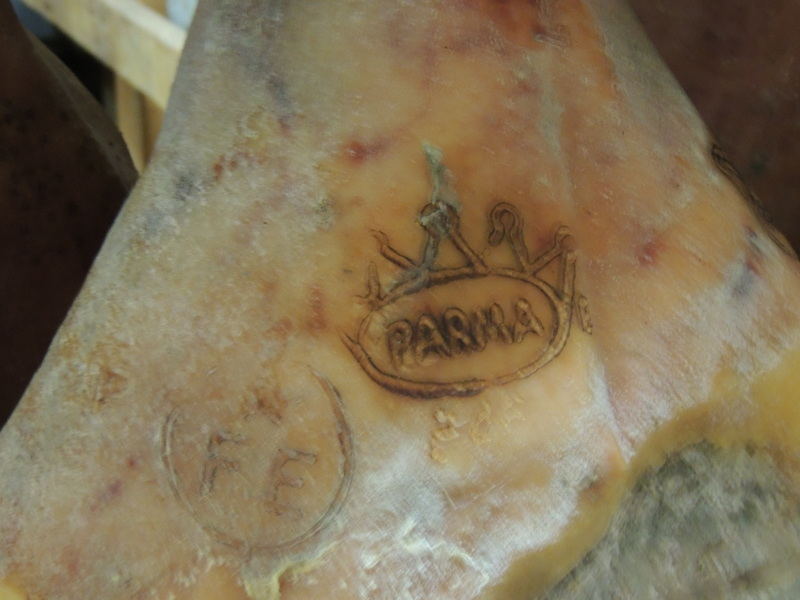 This is a great video about Parma Ham! Share this post with a friend headed to Parma, Italy! Love it! What a fun tour this must have been. Hopefully you were able to have some samples!